I celebrated the first day of spring by wearing this lovely chiffon blouse and drinking a gigantic iced vanilla latte. I saw this blouse a few weeks back at Ross for $30 and passed. I went to Plato's Closet this weekend and found it on a rack for only $9! How awesome is that?! My little brother Gino thinks this top is "groovy" and I totally agree. I added my gorgeous Oia Jules bracelet to play off the coral and blue in the blouse and high heeled sandals because spring is here! Have you had any awesome shopping scores lately?! i like your blouse! it's very missoni without the high price! the perfect boho summer piece too. 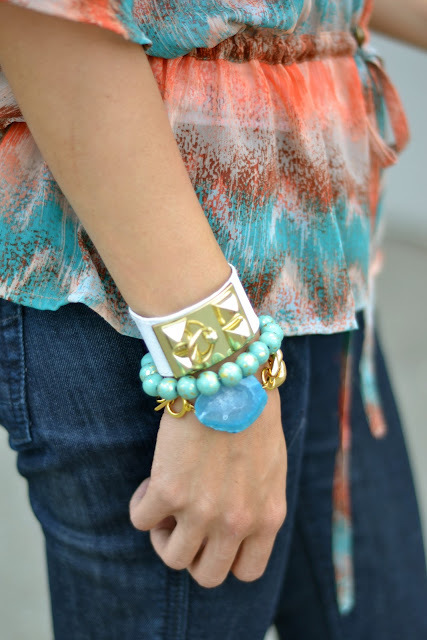 your accessories complement it so well! found you on chictopia today and just wanted to say hi! looks gorgeous! love it :)!